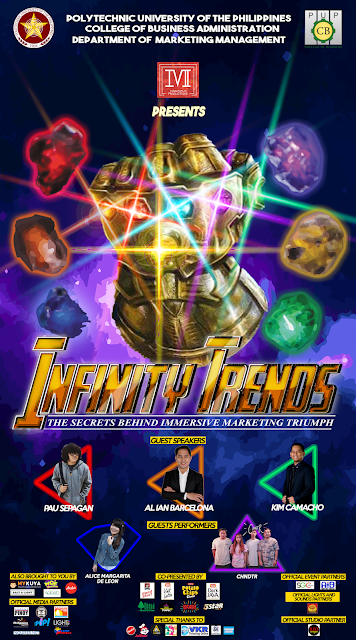 Marvelous Productions, a group of senior Marketing students from Polytechnic University of the Philippines and which its members are part of PUP Junior Marketing Executives (JME), will be having its grand seminar about Marketing Trends and Issues entitled “Infinity Trends: The Secrets behind Immersive Marketing Triumph”. The event will be on the 7th day of March 2018 at the Bulwagang Balagtas, 4/F NALLRC, PUP Mabini Campus, Sta. Mesa, Manila. It will discuss different strategies that had innovatively developed and captured the mind of the present generation in wanting to have greater success. The seminar also aims to provide significant information for future marketers about current and effective hands-on strategies that will be imparted by experienced practitioners. Thus, for this opportunity, the event will cater 1,200 students from PUP and neighboring universities. In preparation for the event, professionals in different fields, who have given significant time and gained relevant experiences on certain marketing trends, are invited to be guest speakers. Mr. Al Ian Barcelona (Managing Director and Chief Awesome Officer of AIB Training), Mr. Kim Camacho (Founder of CKT Dynamic Leaders Training), and Mr. Pau Sepagan (Creative director of Pau Sepagan Studios) will be giving talks about Trend Marketing; Emotional Marketing, Digital Marketing, and Vlogs, respectively. Official event partner: SGC Events Management, and AIB Training Events and Consulting Co.
Suit up and get hyped because the biggest trend-setting event of the year is here! Prepare yourselves as we bring the force of infinite experience. Join us as we give you the POWER to break into TIME and SPACE, to go deeper and discover the REALITY of becoming a successful marketer, forming your MINDS and SOULS in the marketing career. Become the hero of your own triumph by choosing to be one because trendsetters aren't born; they are built.